U. Imtiaz, K. Beliveau, N. Barth. Sept 24th, 2016 American Thyroid Association (ATA), 86th Annual Meeting, Denver, Colorado. Metastatic lymph nodes from differentiated thyroid carcinomas” A. Shifrin, M.
Fischer, T. Paul, B. Erler, K. Gheysens, P. Baodhankar, J. Song-Yang, S. Taylor, V.
Timmaraju, A. Mireskandari, G. Kumar. March 2016 American Association of Endocrine Surgeons (AAES), 37th Annual Meeting. American Association of Clinical Endocrinologists (AACE) 24th Annual Scientific and Clinical Congress in Nashville, TN, May 13-17, 2015. LATE GROUNDBREAKING ABSTRACT. "Primary Hyperparathyroidism in Teenagers and Young Adults has More Dramatic Initial Presentation With an Emergency Room Admission Due to a Very High Hypercalcemia and Also Diagnosed in Advanced Stage" M. Fischer, S. Eapen, M. Smotkin-Tangorra, B. Erler, M. Zheng, and A. Shifrin. American Association of Clinical Endocrinologists (AACE) 24th Annual Scientific and Clinical Congress in Nashville, TN, May 13-17, 2015. "Aggressive Papillary Thyroid Carcinoma Associated With Prolong Graves' Disease"
NEW YORK SURGICAL SOCIETY, Conjoint Meeting with the Philadelphia Academy of Surgery Weill Cornell Medical College; New York, NY. 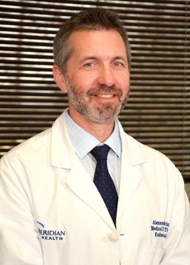 "Primary Hyperparathyroidism in Teenagers and Young Adults has More Dramatic Initial Presentation With an Emerency Room Admission Due to a Very High Hypercalcemia and Also Diagnosed in Advanced Stage" Michele Fischer, BS and Alexander Shifrin, MD. New York Thyroid Club Meeting April 2015 Hackensack University Medical Center, Hackensack, NJ. "Thyroid Nodules in Pediatric and Young Adult Patients have a Greater Likelihood of Malignancy and are Characterized by More Aggressive and Advanced Disease". M. Fischer, S. Eapen, M. Smotkin-Tangorra, B. Erler, M. Zheng, and A. Shifrin. Assessment of Molecular Markers on Preoperative FNA Biopsies of Metastatic Lymph Nodes from Differentiated Thyroid Carcinoma and Correlation with the Primary Thyroid Tumor: the feasibility study. Alexander Shifrin, D. Lann, T. Matulewicz, B. Erler, M.Zheng. 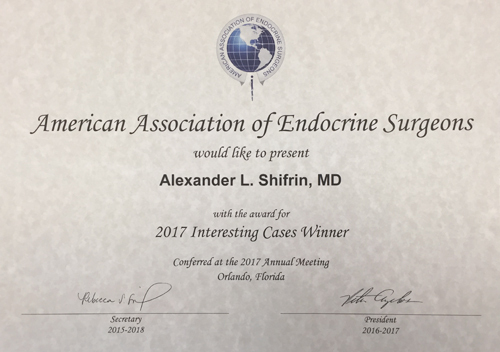 American Association of Endocrine Surgeons (AAES). 34rd Annual Meeting, Chicago, IL. “Patients With Family History Of Thyroid Carcinomas In The Second Degree Family Members Have Carried The Same Risk For Development Of Thyroid Carcinoma As In The First Degree Members.” A. Shifrin, J. Anderson, D. Lann, S.Asnani, MD, Y. Kuo. 82nd Annual Meeting ,Quebec City, Canada ,September 19 - 23, 2012. "BRAF Positive Thyroid Lymphoma: An Unusual Presentation and Clinical Dilemma " L. Jayakumar, D. Lann, M. Elsawaf, P. Mencel, S. Govil, and Alexander Shifrin. 09/2012 - American Thyroid Association, 82nd Annual Meeting ,Quebec City, Canada ,September 19 - 23, 2012 "Initial modes of detection of thyroid nodules in surgical patients in correlation to family history, radiation exposure and final pathological diagnosis " J. Anderson, D. Lann, S. Asnani, Y. Kuo, and Alexander Shifrin. 09/2012 - American Thyroid Association, 82nd Annual Meeting ,Quebec City, Canada ,September 19 - 23, 2012 "Graves Disease In Pregnancy Presenting with Fetal Goiter " J. Fischetti-Galvin, J. Canterino, C. Leo, L. Walker, D. Lann, L. Van Horn, Alexander Shifrin. 05/2012 AACE 21st Annual Scientific and Clinical Congress in Philadelphia, PA, May 23-27, 2012. "NOVEL GENE EXPRESSION CLASSIFIER RAISES PRE-OPERATIVE SUSPICION OF MEDULLARY THYROID CANCER" Authors: R. Kloos, K. O'Rielly, S. T. Traweek, E. Alexander, R.M. Harrell, B. Haugen, E. Khanafshar, J. Klopper, J. Koval, R. Kulstad, S. Reddy, A. Shifrin, D. Steward, D. Chudova, L. Friedman, R. Monroe, N. Sindy, G. Kennedy, R. Lanman. 05/2012 AACE 21st Annual Scientific and Clinical Congress in Philadelphia, PA, May 23-27, 2012. “A RARE CASE OF AMIODARONE INDUCED THYROTOXICOSIS AND THIONAMIDE AGRANULOCYTOSIS” S. Dhillon, F. Cruz,, D. Lann, and A. Shifrin. 09/2010 - 14th International Thyroid Congress. Paris, France. “ Incidence of medullary thyroid carcinoma in the United States from 2001 TO 2007” A. Shifrin, Y.-H. Kuo, J.Davis. 05/2010 European Association of Endocrine Surgeons (ESES) Biennial Congress 2010, Vienna, Austria,“Complete Thyroidectomy on Graves’ Disease: A Population- based Analysis on 923 Patients in the United States” Alexander Shifrin, Yen- Hong Kuo, Yen- Liang Kuo, Jerome J. Vernick, John Mihran Davis. 11/2009 New York Surgical Society. “Pancreaticoduodenectomy at a university-affiliated hospital impact of technique on outcome and quality measures” H Kim, E. Hagopian, Y Kuo, N Ahmed , A Shifrin, J Vernick, J Davis. 06/2009 ENDO 2009, The Endocrine Society 91st Annual Meeting. Washington, DC. “Endocrine surgeon performed preoperative neck ultrasound changes or modifies planed parathyroidectomy procedure in patients with primary hyperparathyroidism”. A. Shifrin, S. Asnani, J. Vernick. 10/2008 New York Thyroid Club. “Incidence of Papillary Thyroid Carcinoma Increased in Patients with Grave’s Disease”. A. Shifrin, C. Xenachis, J. Vernick. 02/2007 New York Surgical Society. “ Negative preoperative localization leads to greater resource utilization in the era of minimally invasive parathyroidectomy” A. Harari, J. Allendorf, A. Shifrin, M. DiGorgi, W.Inabnet, College of Physicians and Surgeons of Columbia University. New York, NY. 2006 American College of Surgeons (ACS) Clinical Congress 2006. “Laparoscopic left adrenalectomy for large 14 cm pheochromocytoma.” A. Shifrin, W Inabnet, J. Grossman. 05/2006 American Association of Endocrine Surgeons (AAES). 27th Annual Meeting. New York, NY, 2006. “Persistently elevated PTH levels during focused parathyroidectomy: do they predict failure or cure? WB Inabnet, AL Shifrin, M. DiGorgi, J. Allendorf, J. Chabot. 05/2004 American Pediatric Surgical Association, 35th Annual Meeting, Florida. “Abnormal Development of the Hepatobiliary System in Nitrofen-Exposed Mice” A. Shifrin, M.Chinoy, P.Dillon. 05/2003 Pancreas Club. 37th Annual Meeting. Chicago, IL. “Innate Immunity In The Pathogenesis Of Acute Viral Pancreatitis” A. Shifrin,C. LeClair, S. Raper. 04/2002 American Association for Cancer Research, 93rd annual meeting. “Tumor infiltration by macrophages and enhanced NO release are key to tumoricidal activity of high-dose rhTNF- alpha in preclinical tumor models.” C.Menon, S.Kelly, G.Karakousis, K.Patel, S.Kesmodel, D.Raz, I.Prabakaran, A.Shifrin, D.Buerk and D.Fraker. 05/2001 Pancreas Club. 35th Annual Meeting. Chicago, IL. “Macrophage depletion diminishes acute pancreatic inflammation and immune responses in adenoviral vector induced pancreatitis.” A. Shifrin, N.Chirmule, S.Raper. 02/2001 Society of University Surgeons, 62nd Annual Meeting. "Adenoviral vector mediated insulin gene transfer in the mouse pancreas corrects streptozotocin induced hyperglycemia." A.Shifrin, A.Auricchio, Q-C. Yu, J.Wilson, and S. Raper. 11/2000 Association for Academic Surgery, 34th annual meeting. "Innate Immune Response to Adenoviral Vector-Mediated Acute Pancreatitis." A.Shifrin, N.Chirmule, K.Chapman, and S.Raper. 10/2000 Surgical Forum and 86th annual Clinical Congress of the American College of Surgeons. "Correction of Hyperglycemia by Adenoviral Vector-Mediated Insulin Gene Expression in the Murine Pancreas." A.Shifrin, A.Auricchio, J.Wilson, S.Raper. 07/2000 Harrison Department of Surgical Research Conference, University of Pennsylvania School of Medicine. Philadelphia, PA. "Innate Immune Response to Adenoviral Vector-Mediated Acute Pancreatitis." 07/2000 Harrison Department of Surgical Research Conference, University of Pennsylvania School of Medicine. Philadelphia, PA "Correction of Hyperglycemia by Adenoviral Vector-Mediated Insulin Gene transfer in the Murine Pancreas." 05/2000 Third annual congress of the American Society of Gene Therapy. "Regulated Insulin Gene Delivery for Treatment of Type l Diabetes" A.Auricchio, G-P.Gao, P.Zoltick, A.Shifrin, S.Raper, and J.Wilson. 03/2000 Diabetes Annual Spring Symposium. University of Pennsylvania School of Medicine. Philadelphia, PA "Correction of Hyperglycemia by Adenoviral Vector-Mediated Insulin Gene Expression in the Murine Pancreas" A.Shifrin, A.Auricchio, J.Wilson and S.Raper. 03/2000 Diabetes Annual Spring Symposium. University of Pennsylvania School of Medicine. Philadelphia, PA "Regulated Insulin Gene Delivery for Treatment of Type l Diabetes" A. Auricchio, G-P.Gao, P.Zoltick, A.Shifrin, S.Raper, J.Wilson. 01/2000 Harrison Department of Surgical Research Conference, University of Pennsylvania School of Medicine. Philadelphia, PA "Intra-Pancreatic Gene Therapy". 12/1999 IHGT/MCE Conference, Institute for Human Gene Therapy, Department of Cell and Molecular Engineering, University of Pennsylvania School of Medicine. Philadelphia, PA. "Depletion of Macrophages and Vector Constructs for Intra-Pancreatic Gene Therapy"